Align, Place & Solder All SMD's, QFN's & BGA's. PCB Design Prototyping! Reballing BGA's, BGA Alignment, Placement, Preheat & Reflow at the Bench! SMT Repair! than routine benchtop methods" and "minimizes thermal stresses due to temperature differentials during assembly and rework"
Yes, this is the very system that set all the standards! 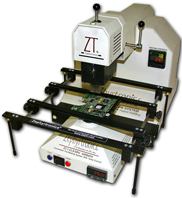 Thousands now on benches around the world, the patented, time-tested ZT-7 makes quality PCB prototype tasks and rework easy. It easily outperforms other "high end" BGA stations priced over $20,000-$50,000. Yet it is so affordable starting at $3,995! Align, place and solder BGA, SMD, QFN, LGA chips (just so many more) and/or de-solder and automatically remove them without lifting PCB pads or thermally damaging adjacent chips! Used by NASA & JPL on the successful Mars Rovers (Spirit, Opportunity, Curiosity) and the Phoenix Lander, the ZT-7 is engineered for dependability and long, industrial life. This is still the best, and yes, valued BGA & SMD rework station with a full 2-Year limited warranty! The ZT-7 is made under tight control at the Los Angeles factory of Zephyrtronics, winner of the coveted Vision Award for Best New Product at the Surface Mount Int'l Expo at the San Jose Convention Center in Silicon Valley! 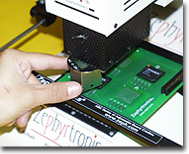 The Zephyrtronics ZT-7-000 BGA, SMT & CSP Comprehensive Benchtop System. Video! See the ZT-7 System in Action! Program Up to 31 Custom Thermal Profiles! The ZT-7 does not rely on do-it-yourself, unrepeatable, unreliable, external "taping" thermocouples to your PCB. Temperature control is integrated into the system with full closed-loop sensing. The easy-to-access front panel controller permits up to 31 custom thermal profiles with multiple ramp, soak and final solder reflow functions, all storable for different PCB's! Preheat your chip from above while your PCB is also preheating below to speed up your process and for greater quality. You have control. 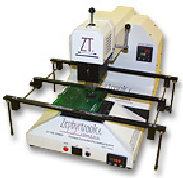 The ZT-7 does not rely on unpredictable, unstable infrared (IR) for preheat or solder reflow, but utilizes the long-established and superior industry standard (60 years) of forced convection. 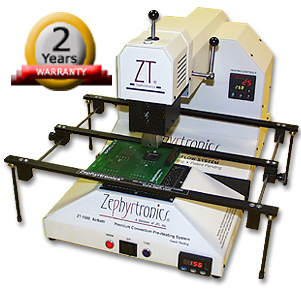 The ZT-7 is the #1 PCB station for Smartphone, Laptop, Tablet and Flat Screen repair. Simplicity & Reliability: The easy-to-operate ZT-7 was developed for prototype work, low volume production, secondary operations, and rework of electronic printed circuit board assemblies (PCBA’s) at the bench for BGA, CSP and/or SMT components. All of the critical process controls "built in." The ZT-7 was engineered to eliminate need for compressed air hook-ups, air pressure settings, external fanning equipment, awkward foot pedals. There are no exposed air hoses or moving electrical cords as with other "systems". The ZT-7 is a fully-integrated, digital system for meticulous, thermal profiles just like those in high volume production equipment with temperature ramp, preheat, soaking, solder reflow and cooling. Plus, the ZT-7 is whisper quiet in operation with big LED digital display, not tiny eye-straining LCD displays. 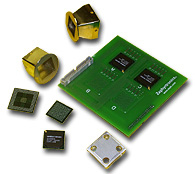 Unique, Sliding & Retractable Heat-Zone: The ZT-7 heat zone travels to the targeted chip unlike other BGA "machines" with functionally-fixed heat zones. 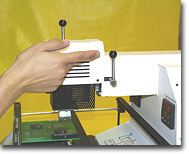 Technicians can prep, solder, desolder, clean and inspect their PCB without moving the board. 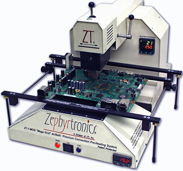 David Jacks, president of Zephyrtronics, introduced this concept to the world in the early 1980's. The ZT-7 slidable heat zone rides on precision ball bearings, not cheap, jerky kitchen door slides on other "machines". On Benchtops Around the World! From high reliability applications (space, military and medical) to even rework of commercial video game consoles like the XBOX360® or PlayStation® or smart-phones, tablets, laptops, flat-screens and forensics, the ZT-7 is at work even as you read this around the globe. How to Align BGA's to the PCB Pads? 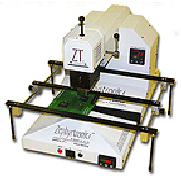 With our exclusive and patent protected Single-Spot, Single Axis Alignment, Placement & Reflow. The ZT-7 System NEVER requires moving the PCB once your BGA or SMD is aligned and placed and each ZT-7 ships with The BGA Primer for how to quickly and precisely align and place BGA’s to substrate pads and how NASA "explains" this simple method of placing BGA's to pads...and how to redress pads without solder wick, see Re-Dressing Your BGA Pads. Auto-Lift De-Soldering: For de-soldering and removing chips, a semi-automatic spring-activated vacuum probe lifts BGA's and SMD's up off a PCB as solder melts taking out the guesswork -- so you won't lift pads. When the solder melts, the chip pops up into the nozzle! See this actual BGA desoldering process in this short, helpful Video: DeSoldering & Removing a BGA. The video shows actual board prep, aligning, flux application, automatic chip removal, cleaning and touches on inspecting the PCB and familiarizes you with the ZT-7 in action! Forced Hot Air Convection is Superior to IR for PCB Prototyping, Rework & Repair: There are many problems with infrared (IR) for PCB's, which is why it really never caught on and why so many of these "systems" have been relegated to landfills. Some drawbacks (many enumerated in articles and white papers at electronic expos) range from serious chip shadowing and lack of true thermal ramping because repeatable temperature control is not likely with IR. IR "systems" depend on technician guess work, including an idiotic requirement of taping thermocouples to your PCB to achieve sensing feedback. 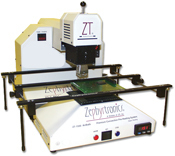 But the ZT-7 has built-in, closed-loop, temperature sensing during both preheat and solder reflow. No "taping" of thermocouples or using aluminum foil is required. Learn of the many problems with IR systems here Pitfalls of IR Preheat & Reflow System Video. The ZT-7 is not limited to only surface mount devices, but excels for even difficult through hole (PTH) de-soldering tasks with connectors, sockets, metal shields and PGA's. 1.) Our low velocity heated air from the nozzle prevents unwanted adjacent chip reflow. Because caps and resistors surround BGA's, low air velocity is a key advantage! So ahead of its time! 2.) Low velocity heated air is for micro-soldering and won't blow or scatter solder about like other stations. 3.) Our less-than-18 CFM air velocity helps prevent hydroplaning small chips. Aligned chips stay put. What's Our Secret? Low velocity nozzle air flow is only possible because Zephyrtronics has ample preheating air flow from below the PCB with our AirBaths™. High volume, low temp preheated air flow from below permits minimal air velocity above from the nozzle. Other rework machines get this so wrong. Ineffective preheat requires wrongly compensating with higher temps and nozzle air velocity. Very bad. What about QFN's and E-Pads? Those pesky QFN packages and their "e-pads" or "thermal pads" or "belly slugs" on the chip's bottom are easy to work with with the ZT-7! And this is a big advantage when using lead-free solders. Patented BGA Alignment Template Eliminates Need for Expensive Vision Systems. World Famous & Recognizable Trademarked Design. Extra Large PCB's Are No Problem! The ZT-7 easily accommodates PCB's up to 20.5 inches (52 cm) in depth (no limitation in length). Naturally, smaller PCB's are no problem either. Part of the innovation of the ABC Board Cradle is that the PCB locking knobs are not on the top, so even gigantic PCB's can rest flush on the table top open frame. Brilliant! Modularity & Independent PC Board Fixture: The ZT-7 works in concert with our AirBath Bottom-Side Preheaters and ABC-1 Board Cradles. AirBath Preheaters nest right under the ZT-7. Because ABC Board Cradles is Independent from both the ZT-7 and the preheater, it is possible to work simultaneously with multiple PCB's. A technician can preheat other PCB's in tandem on another ABC cradle and "swap" them back and forth doubling up productivity! Further, the system's modularity allows a technician to use the ZT-7, the AirBath™ Preheater and/or Board Cradle independently at different benches if needed. Is this really important? You bet it is. Here's a short 4 minute video anyone considering purchasing a rework station should view and seriously consider: Advantages of Independent PCB Holders. Easy Nozzle Docking With 360° Nozzle Theta Rotation Adjustment: Insert and remove nozzles from the dock without screwdrivers or tools. Nozzles slide into the tray and lock in place. The ZT-7 features two 360° adjustments for both nozzle and the vacuum probe. Ideal for angled and/or skewed chips. Vast SMD & BGA Nozzles Available at Low Cost: Since we are "the factory", we have been fabricating nozzles since 1998 and have thousands of various styles from 50mm x 50mm to 2mm x 2mm in stock. And custom nozzles require less than 10 days and cost no more than our regular nozzles. See Our Enviable Nozzle Catalog Here: BGA/CSP Nozzles or SMT Nozzles. And all very low priced! All Zephyrtronics nozzles are permanently "stamped" with both the part number and the size of the nozzle for your quick reference! Who else does that for you? Critical Post-Cooling Feature: The ZT-1 AirBath is not just a preheater, but also has a "Post Cooling" mode. Post-cooling BGA's an absolute requirement so molten balls/pads interface cool quickly preventing bridges and "opens". For more info: Two Critical Processes: Pre-Heating & Post Cooling. Front-Access Nozzle Dock Makes Changing Nozzles Quick & Easy. Nozzles "Lock In" Securely! The ZT-7 Excels with RoHS Compliant, Lead-Free Solders! Because every ZT-7 Hot Air System includes a ZT-1 AirBath preheater, lead-free soldering is a breeze. Unlike some systems, you won't need to remove adjacent chips by the BGA before soldering or desoldering. The powerful capacity of the AirBath Bottom-Side Preheaters is the key element here. Learn more here about the RoHS Lead Free Mandate. Production Quality Profiles: Because the air temps of the ZT-7 and the ZT-1 are managed by easy-to-use digital controllers on the front panels, technicians can confidently expect thermal profiles at the bench like those with high volume production equipment like conveyor ovens, IR/Vapor and wave solder machines. So why buy one of those machines that don't work? Don't let the simplicity and affordability of the ZT-7 let you underestimate its capacity, utility or its quality performance. This is the very same ZT-7 chosen by both NASA and JPL for soldering the BGA's and SMD's on the 3 highly successful Mars Rovers Missions: Spirit, Opportunity & Curiosity. Even massive full metal-topped BGA's used on the Rovers were soldered with the Zephyrtronics ZT-7! Indeed, NASA engineers prepared a 39-page document touting the ZT-7 System in a detailed report for its employees which includes nearly 300 color photographs of the system along with helpful tips for prototyping PCB's and rework, repair, soldering and desoldering. This helpful report is included with every ZT-7 along with the Zephyrtronics detailed Owners Manual. What other manufacturer of SMD/BGA stations can make that claim? The ZT-7 is used by engineers in aerospace companies like Lockheed-Martin® and Boeing®, and in the labs at Harvard, M.I.T., Sony®, Intel®, International Rectifier®, National Semiconductor, Xilinx®, LSI Logic®, Motorola®, Agilent®, the CIA and many more of the world's most prestigious commercial, academic, military, medical and electronic campuses. Since 1998, it has consistently been the number one SMT & BGA benchtop system. Easy to use? Absolutely. Affordable? Definitely. Dependable quality? Well, the solder joints made with the Zephyrtronics ZT-7 by JPL were catapulted out of the atmosphere at 4 million Newtons (900,000 pounds) of thrust, traveled over 500 million kilometers (310 million miles) at 25,000 miles per hour enduring extreme thermal conditions coupled with exposure to gamma rays, survived landing impact onto the red planet's surface allowing the Rovers to perform so admirably on the rugged terrain of Mars. How's that for quality solder joints? Rapid, Easy Nozzle Docking! No Tools Required. Nozzle Slides In & Out of Convenient Front Access Tray. Unique Lock Prevents Nozzle Movement. Spring Activated Vacuum for Placing & Removing Chips. Probe features 360° Full Rotation for Component Theta Control. Probe Auto Lifts Chip at Reflow. 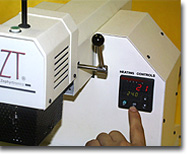 Precision, Closed Loop Digital Temp Control With Real Time Digital Display of Thermal Activity. Plus Set/Read Buttons. 360° Full Nozzle Rotation for Skewed or Angled Components. Plus a Component Theta Probe. (Double Theta Capacity. Unique Slidable Y-Axis Heat Zone Permits Back & Forth Motion On Precision Ball Bearings (Not Cheap Kitchen Drawer Slides!) Y Axis Allows You to Align, Place, Solder, Clean & Inspect at Same Spot. Up to 31 Programmable Custom Profiles & Up to 99 Segments At Front Panel With Big LED Easy-to-Read Display. No Eye-Strain LCD. Up to 20 1/2" (52 cm) Deep. Where You Need it. No Need for Clumsy Foot Pedals. 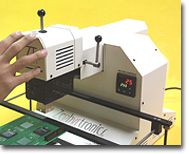 Z-Axis Lever for Raises & Lowers Heat Zone To & From PCB Assy. Aligned BGA's Never Are Move Once Placed. Onto PCB. Zephyrtronics Benchtop System Were World-First With Replication of the Original Soldering Profiles Used in Conveyor Ovens Even Including PostCooling™! Prototype Design Labs, PCB Rework & Repair, Multi-Tasker. Pull Out Easel, Stand-Up Base, Battery. Large, Easy-to-Read Digital Display. ZT-7 has over 21 years of history. the ZT-7 Hot Air System. ©1996 - 2011, 2012, 2013, 2014, 2015, 2016, 2017, 2108, 2019 by Zephyrtronics®. All rights reserved. The information, text, images, photographs, charts, graphs you receive online from Zephyrtronics® are protected by the copyright laws of the United States. The copyright laws prohibit any copying, redistributing, retransmitting, or repurposing of any copyright-protected material. Zephyrtronics is the registered trademark property of JTI, Inc. "The Science of Zephyrtronics" and "Simplicity Through Innovation" and "Zephlux" and "ZeroLead" and "ZeroTouch" and "Zero Balling" and "Zero Residue" and "Post Cooling" and "Post Cooler" and "AirBath" and "SolderGlide" and "ZeroTouch" and "SolderMill" and "Just So Superior" are the protected trademark property of JTI, Inc. "Zephyrtronics" and "Low Melt" and "Air Fountain" and "Fountainhead" are the registered trademark properties of JTI Inc. *The above names are the registered property of their respective owners.